We got into snowkiting because we were looking for things for our avalanche crew to do during their time off, found that it was great fun, and then we got into water kiteboarding in summer. Now we love kiting so much that we are providing gear, teaching classes, and setting up kiting adventures for visiting kiters and film crews. 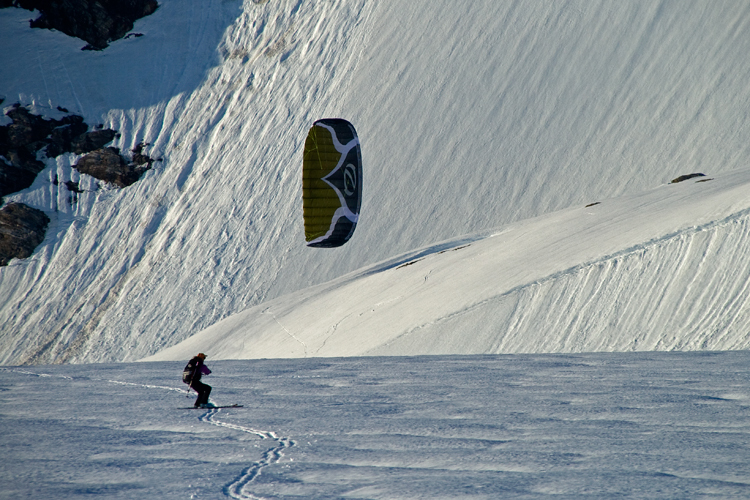 Above: Nancy Pfeiffer snowkiting, Juneau Icefield, May. Kiting is not hard to learn, and is a great sport that is very well-suited to our region. You can get out for a kite break any time you have two hours with a breeze, and come back refreshed and stoked. Start with a look at all the details, photos, and information on gear, places to kite, online videos, and how to get started on our About Kiting page. 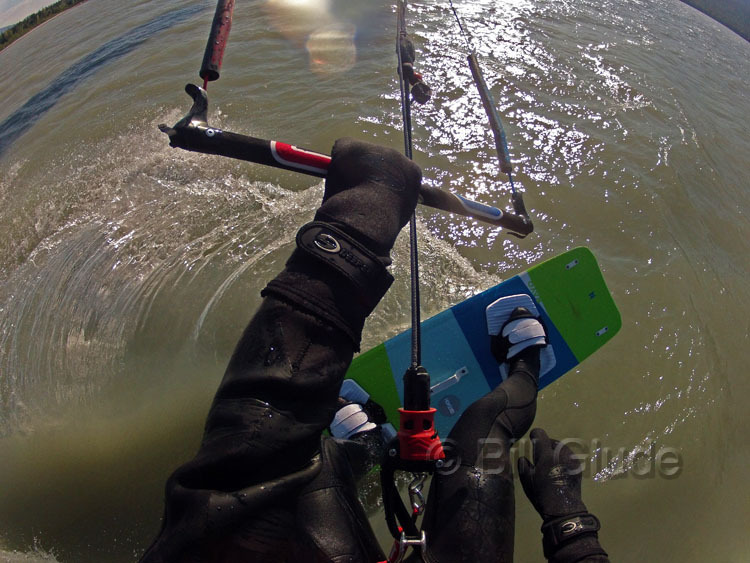 Check our snowkiting and water kiteboarding photo galleries. If you're interested in learning, check our kite lessons, and look over our handouts and course materials page. For gear, scroll down for kite gear on sale, and information on the brands we carry. 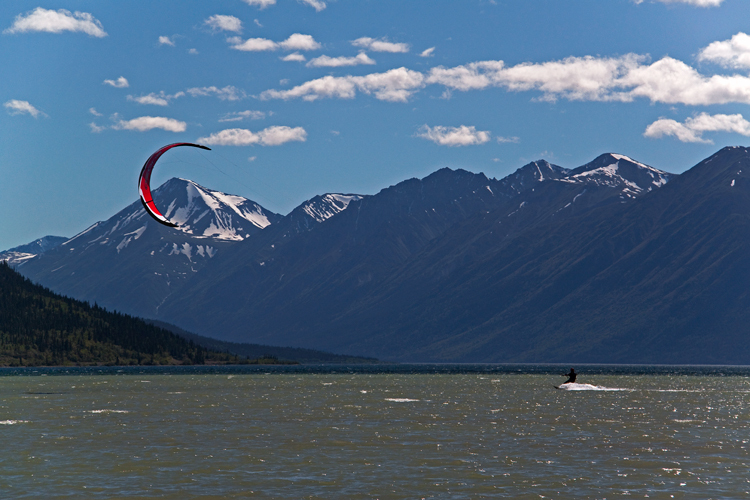 Above: Bill Glude kiteboards on Lake Bennett, Carcross, Yukon. Photo © Melora Gaber. We have free trainer kite coaching, and demo gear for experienced kiters at our kite demo events. We also teach regular kite lessons, by the hour or as a package, in Juneau, Haines, and Skagway. Our rates are lower than most in the 48 states, and you save on travel by learning here, too. We are the Ozone kite dealer for our Southeast Alaska region. Being small, we focus on a limited but carefully chosen selection of our favorite kite gear: Ozone kites, Xenon boards, and Da Kine harnesses. We stock those brands, and have demo gear for people to try. We can also order gear from most other lines, including Airush, Cabrinha, DaKine, Gin, Naish, and Slingshot. We set our prices fairly based on what we have to pay, and the freight cost to Alaska. We offer the best deals we can, including free shipment for new gear to anywhere in the US, and are not able to dicker further on pricing. 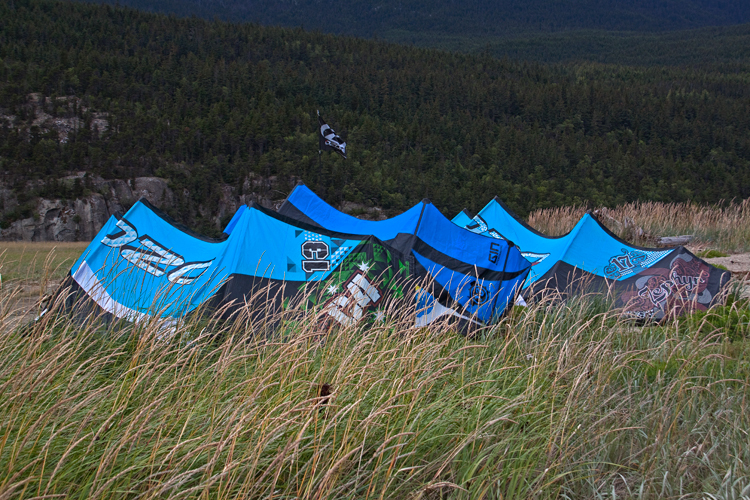 Above, kites ready for Kite Demo Days, Skagway. You can buy kite gear from us online or at our office store. Call to set a time to meet up, as we are still in temporary quarters. There's no penalty to ordering from an Alaskan supplier - our prices are the same as in the other states, and we offer free Priority Mail shipment on new kite gear to any US address! Our shop is small, so all orders receive personal attention. To order, just give us a call or drop us an e-mail and let us know what you want. We can advise you on the best choices for your needs, quote you a price, check how soon we can get it to you, accept payment by credit card through Square, and can usually get your gear to destinations in the US within a few days to a week. All are sold now, sorry. But we can order the new ones, and our shipping is free! Photo on right © Melora Gaber. We have sold all our demo. and overstock water kites now, but can get all the current Ozones with the more-durable D2 ripstop fabric and latest design, with free shipping anywhere in the US, generally within one week. We can order these great Xenon boards but our distributor's supply is limited and they have proven very popular, so order early! More information on why they are so much in demand is in the Why We Carry Xenon Boards section below. 129, 132, 135, 138 Xenon LaLuz (left above), more rocker for maneuverability, carbon for pop, Retail	$766. 130, 134, 137, 145	Xenon Rayo (right), flatter rocker for early planing and making it through those notorious Alaskan wind holes. Retail	$689. We can order the high-performance Infra twin-tip and the versatile Prisma directional surfboard, may addd them to our demo fleet, and can order either of those or the directional Vidra surfboard. Above: Ozone C4 13m and Xenon Rayo 138cm; high tide slough-riding, Mendenhall Wetlands, Juneau. Ozone is a rider-owned company. It was started in Great Britain by a group of paraglider pilots for the purpose of developing and producing the best possible wings, foils that would fly better than anything on the market. From their development of high-performance paraglider foils came their foil kites for snow and land, which are well-known and widely regarded as the best-quality and highest-performing snowkites on the market. We recommend their popular, stable, forgiving, and lower-cost Access snowkite; and can also order the high performance, yet forgiving Frenzy, the high-aspect advanced mountain kiters' favorite Summit snowkite, and the new all-terrain (snow and water!) high-aspect foil Chrono. Their water kites have the same quality construction and finely-tuned aerodynamic design as the foils, and are very well-known and respected in Europe and most of the world's kite spots. They are still not quite as well-known in the US, but the Catalyst's all-around easy performance, the REO's phenomenal wave handling, the Zephyr's range and quick light-wind handling, and the Edge's surpassing performance in course racing are all making US water kiters take notice. We recommend the two Ozone water kites that we have found are the most popular and best-suited to our conditions. The Catalyst is a true do-everything kite, light for travel and waves due to its three-strut design. It has Ozone's superb quality and clean airfoil design, at a lower cost. 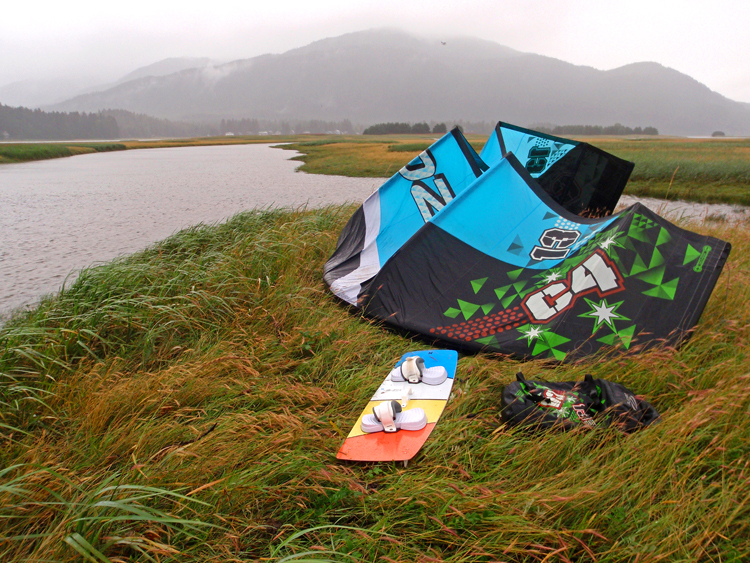 The original was rated one of the top three all-around kites in the January 2012 issue of Kiteboarding Magazine. The 2013 redesign shifted to a hybrid-C shape that has been fine-tuned since. 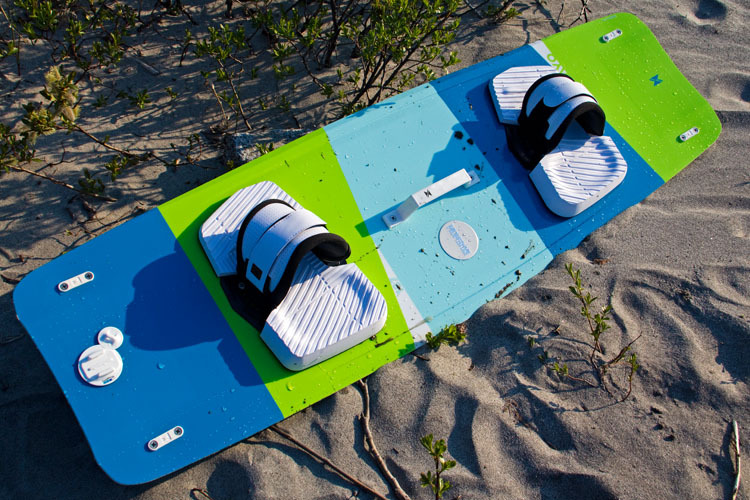 The Kiteboard says of the 2014 model: "Testers felt the Catalyst had lighter bar pressure and praised it for its stable handling and quick turning speed. They also found it predictable and user friendly with precise steering response and appreciated the Catalyst for its above average boosting and good hangtime." We recommend the five-strut 17m Zephyr bow kite; the magic kite for our typically light but gusty Southeast Alaska winds. This kite gets you on the water when no one else is out. 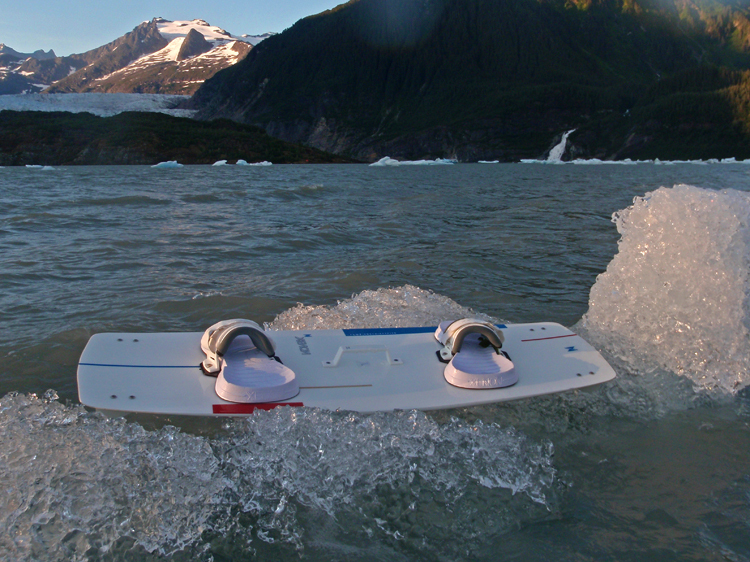 In Juneau, it doubles our days on the water. It is incredibly rangy and maneuverable, easily outperforming any other big kite we have flown. The original Zephyr was the first real performance light-wind kite, and the current models are even faster and quicker-turning; while retaining the Zephyr's low-end power and ability to handle strong gusts with ease. Here's a review of the Zephyr. A Zephyr and two or three Catalysts is the perfect kite quiver for most riders here, but we can order Ozone's specialty kites if you need something to fit a particular style of riding. If you are mostly into jumping and wakestyle riding, or just like that direct C-kite feel, we can order the the C4 5-strut bridled-C kite. For wave kiters, we can order the REO three-strut hybrid C wave kite with its unmatched drift, and performance optimized for surfboards. For racers and big air fans, we can order the super-fast high aspect 5-strut Edge bow kite that dominates racing and big air contests. For advanced kiters looking for speed and light-wind performance, we can order the new all-terrain (snow and water!) super-high-aspect foil Chrono or the new R1 racing foil, both of which have been winning lots of races lately. We recommend the Ignition foil trainers, with their three-line flag-out release. Buy one, and when you buy your fullsize kite gear from us, we will take the price of your trainer off your first full price big kite! We stock the Uno tube kite trainers, which fly off a regular lineset and harness, and which we find give our students a tremendous head start toward handling full-size kites. We can special order Ozone parafoils. The Ozone website is the best online source of information on current models and their features. We can advise you on kite choice as well. Xenon boards come from another European company that has rapidly gained a reputation in the US for their great boards. They are light weight (good for travel! ), wood-cored boards with full ends that promote early planing and good pop for jumping, combined with a soft-enough flex to keep those big ends from catching in the chop and to give them an uncommonly smooth, no-chatter ride. Most kiteboards are too stiff to give the ride the Xenons do. The straps and pads are easy to adjust and very cushy. We recommend the lightest-weight LaLuz (earlier model 135 above, on the iceberg), with carbon for rapid rebound and more rocker for maneuverability; and our favorite Rayo (137 x 42 below, on the water which comes in mid to larger sizes, has less rocker for early planing, and the best performance in our typically "holey," inconsistent wind. We have demo boards in the Rayo model, and can order your board in a two-week timeframe, provided there is stock available. We can order the high-performance Infra twin-tip and the versatile Prisma directional surfboard. 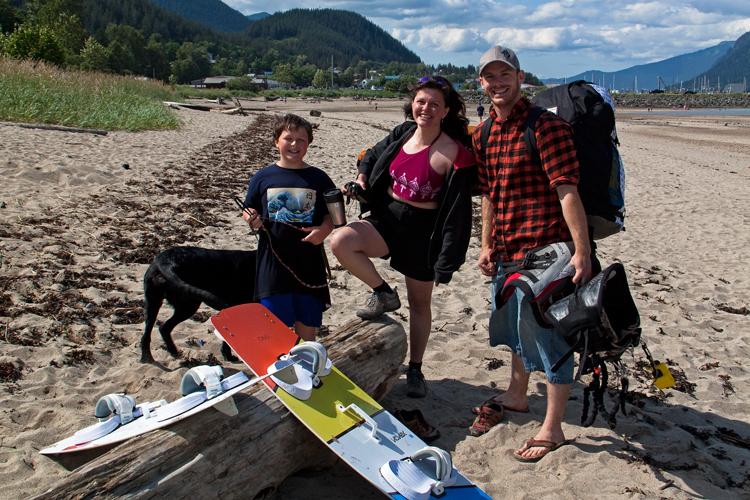 Above: Cedar and Lisa Miles and Josh Mitzell help carry the harnesses and gear after a fine session at Sandy Beach, Juneau. DaKine has long been a leader in building the toughest and best-designed harnesses for windsurfing and kiting, and the best board bags for travel. We can order any of their wind sports gear, but we stock their lightweight Chameleon waist harness ($160) and use it for teaching. Juneau kiters travel, and this harness saves enough weight to bring one more kite along in your bag. If you want to mix your sports, it is also designed to work well for both kiting and windsurfing. Our favorite wheeled board-and-kite bag is the compact and flat SX Bag. The 140cm version easily carries a twin-tip board and two to three kites at 84" total dimensions, just over the 80" limit but close enough that Alaska Airlines has often taken it without oversize charges. The 185 cm version fits kiting surfboards to 183cm (6') length. We like to balance our other bag on top of the SX as we wheel it through the airports. We can order any of DaKine's other board bags.